If you call him a jinx breaker, you are not far from the truth. The reason is that many students had tried to graduate from the University of Ilorin with a first class degree in Law for many years, but they failed for one reason or the other. Finally, on Tuesday, however, Abiodun Kazeem achieved the feat, drawing accolades from many people. Kazeem studied Common and Islamic Law at the institution, which became a full fledged university in 1976. Achieving this feat, according to him, is something he will always cherish. But he never forgets to note that his march through the system was a tough one. For instance, he recalls that he did not get admission into the university on a platter of gold. He sat for the Joint Admissions Matriculation Board’s examination twice, in the course of which some of his friends tried to convince him to forget about applying again. Between 2007 and 2008, he worked with one of his uncles, Mr. Tahiru Adeosun, who has a law firm in Ilorin. While the experience might have influenced his academic strides on campus, from his first day in the institution, he had his mind set on obtaining first class degree. Yet, some of his colleagues tried again to discourage him. They reminded him that no one had ever achieved that feat in the institution as far as the faculty was concerned. But he remained resolute. Twenty-six-year-old Kazeem, who hails from Iganna in Oyo State, says he is from a polygamous home. His father, Muideen, has 12 children. His mother, Mulika, gave birth to six of them. He states that settling for Law in the higher institution was largely due to the influence of his uncle. Perhaps, he could have read Mass Communication and not Law. According to him, his nickname in secondary school was Mr. Mass Communication, due to his writing skills and gift of oration. He recounts his days at Community Grammar School, Iganna. “I decided to read Law because my uncle, a lawyer, inspired me. I wanted to study Mass Communication. I was very eloquent and I was in the Press Club in the secondary school. But when I got to my uncle’s chamber, he influenced and inspired me to read Law. I never dreamt of becoming a lawyer,” he says. Beaming with excitement and a sense of accomplishment, Kazeem adds that this feat is an honour for his generation and his people in Oyo State. For now, he is preparing for the Law School, after which he will choose between three directions he has envisioned for himself. He hopes to become a lecturer, to inspire young people, practise Law or participate in politics, either actively or passively. 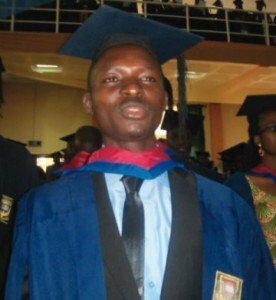 Kazeem is one of the 41 graduands from various faculties in the university who bagged first class degrees at the ceremony, with 1,088 making second class upper; 2,435 had second class lower. In the third class degree category are 1,082 students and 214 had ordinary Pass. A further breakdown shows that a total of 5,063 of the 6,713 students that graduated obtained first degrees, 756 got Master’s degrees; 95 bagged Ph.Ds; while 84 got postgraduate diplomas. Speaking during the grand finale of the convocation on Wednesday, President Goodluck Jonathan, who was represented by the Supervising Minister of Education, Mr. Nyesom Wike, frowned on a situation whereby university graduates lack relevant skills due to poor training that makes them unemployable. He said this was intolerable. The President said the Federal Government alone could not effectively fund universities in the country. He added that all stakeholders must be involved in cost-sharing to adequately run the institutions. Noting that university teachers must re-orientate themselves and avoid unnecessary strikes, Jonathan called on striking members of the Academic Staff Union of Universities to call off their lingering strike. He said the FG would systematically continue to address the challenges in the university system. According to him, apart from establishing 12 new federal universities, government has also increased the carrying capacities of existing universities to boost access to higher education. Besides, Jonathan said, the FG had increased the budgetary allocation to education from N234.8bn in 2010 to N426.5bn in 2013. He added that the government was seriously considering the best ways to ensure the implementation of the ‘Report of the Needs Assessment Committee for Universities’. The Vice-Chancellor, UNILORIN, Prof. AbdulGaniyu Ambali, said part of the problems facing Nigeria was brain drain and capital flight. He stated that it would take the doggedness of Nigerians to develop the country to a nation that they would be proud of. He noted that there were still untapped opportunities in the country, adding that the thinking that Nigerians could only survive abroad was erroneous. He urged the graduands to be good ambassadors of their parents and their alma mater. The VC said the institution was making efforts to start new undergradaute programmes in 2014. He noted that part of the challenges facing Africa and Nigeria was the failure of its brilliant young people not returning to Nigeria after their studies abroad.